Working with industrial machinery can present a number of challenges for equipment operators. In addition to needing the level of knowledge required to operate, milling machines, band saws, and near dry machining equipment also need a steady stream of regular maintenance. If certain maintenance procedures are not performed consistently, your tools and machinery will be unable to make the accurate cuts necessary. Furthermore, working with equipment that receives little to no maintenance can put an operator’s safety at risk. 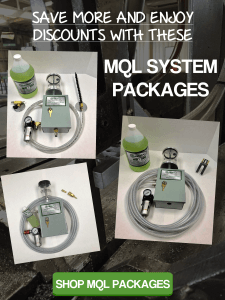 When looking for ways to keep your heavy-duty near dry machining cutting tools in good condition, you can’t go wrong with industrial lubrication systems from MagLube.com. If you’re passionate about near dry machining, you’re sure to love the cutting edge lubrication systems we sell at MagLube. Since our lubricants are much thinner than other water-soluble coolants, they’re able to effectively clean your machining equipment. This effectively eliminates the need for manual component cleanings, thus saving tool operators a substantial amount of time. Most industrial tools for near dry machining require regular lubrication to produce consistently accurate cuts. Countless instances of improperly cut lumber, metal, and wood can be directly traced back to infrequent lubrication. In addition to consistently lubricating your blades, you’ll need to do so with a lubricant that has a proven track record of excellence – like the groundbreaking lubricants developed by MagLube. Like your company’s cutting tools, the corresponding lubrication systems should be views as investments. The more lubrication your tools receive, the better equipped they’ll be to produce accurate cuts – much to the satisfaction of your clients. This will make newer clients more apt to work with you again and make regular clients feel justified in giving you their continued patronage. Industrial lubrication systems are an absolute must for companies that make extensive use of industrial cutting tools for near dry machining. Not only do these systems save operators a tremendous amount of time and effort, they play a valuable role in extending the lives of various equipment and their respective components. Be sure to shop MagLube today for the best eco-friendly industrial lubricants.